As a non-aligned, grassroots, national online publication in Wollongong NSW, Mirage News covers important developments based on direct firsthand sources, including media & public releases to deliver the news as it is with no comment or interpretation. This provides the public with free timely access to the government and other everyday news stories free from encroaching corporate, ideological or any other interests/influences. Originally established as a user-submitted news content site in 2007, Mirage News has gradually evolved as a source of unbiased, accurate, compelling and diverse stories to reflect the pulse of developments anywhere, anytime all across Australia and countries of interest for the Australian community. We adhere to the fundamental tenets of ethical journalism including honesty, fairness, independence, diversity, accountability and transparency. In this era of the internet and globalization, most of us may feel a plethora of information and viewpoints is available. It might seem that the apparent surge in information availability and media choices eventually is leading to better public access to impartial original information. Unfortunately, this is not the case. Media ownership in Australia is one of the most concentrated in the world. Since the trend of consolidation is and has historically been upward, fewer and fewer individuals or organizations control increasing shares of the mass media in our country, attempting to manipulate public opinion. According to independent assessment, about 98% of the media sector is held by three conglomerates. This tendency is not only totally unacceptable, but also to a degree frightening. The simple fact is that overwhelming concentration of ownership in the hands of a set of powerful interlocked barons means we can only read, hear and learn what and how they deem appropriate. 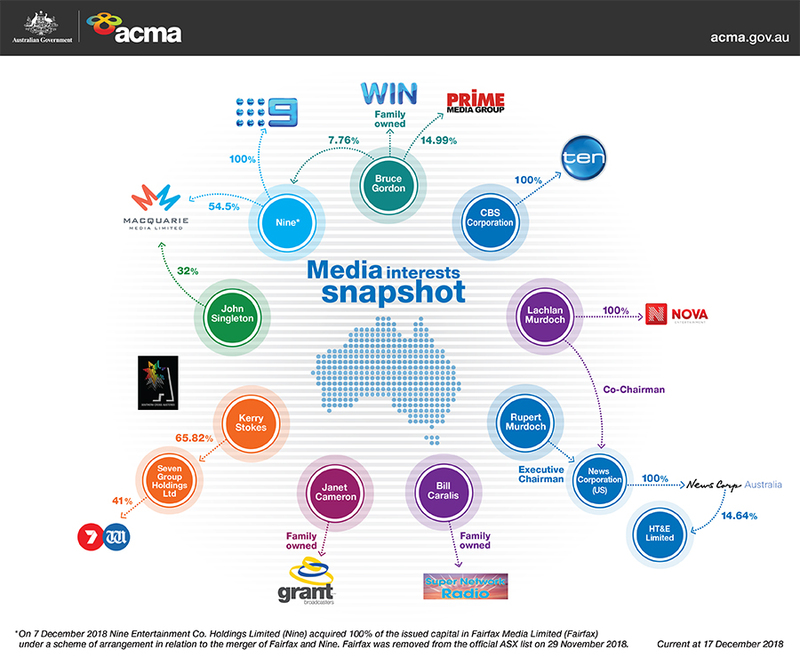 The Media Interests snapshot below from the Australian Communications and Media Authority provides an overview of the main interests in major commercial television and radio networks and associated newspapers. Newspaper ownership in Australia is even much more concentrated. The Australian section of the University of Oxford’s Reuters Institute Digital News Report 2016, concerning 26 countries, concluded that “Australia has a high concentration of traditional media ownership dominated by News Corporation and Fairfax Media who together own the majority of national and capital city newspapers”. Except for Sydney and Melbourne, almost no other large Australian city has more than a single daily newspaper or equally competing media outlets to provide alternative information access. 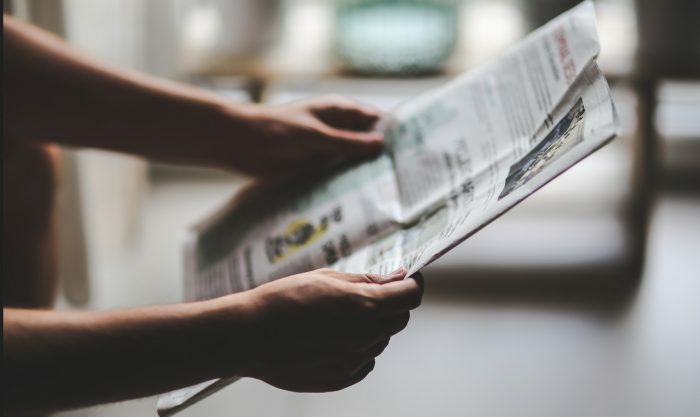 An international study led by US scholar Eli Noam found that Australian newspaper circulation was the most concentrated of 26 countries surveyed, and among the most concentrated in the democratic world. The situation is not any better in pay or online TV sector either. For example, News Corp owns a lion’s stake in Foxtel – which has a monopoly in the pay TV market – and Sky News, which is carried by Foxtel. Article 19 of the Universal Declaration of Human Rights unambiguously declares that everyone has the inalienable right “to hold opinions without interference”. However, the current trend of monopolization denies this fundamental right because media misusing public trust influences all – from what you will eat tomorrow to who will win elections. In order to reinforce the dominance of their own media empires, the media conglomerates stifle the growth of new media start-ups and cut off their reach to consumers. Successive governments from the both sides of politics have failed to address this problem because nobody wants to run head-to-head with the media. An independent inquiry into the media and media regulation in 2012, otherwise known as the Finkelstein report, described the landscape of Australian media as: “too concentrated in ownership, biased, vindictive, sloppy and at times unethical in its coverage of people and events”. Our goal and mission is to provide free and alternative access to impartial information, fighting media monopolization and adhering to honesty, neutrality, fairness, transparency and independence in collection and dissemination of information, free from encroaching corporate, ideological interests. It is a bumpy road with all sorties of difficulties. We can only achieve this goal together. Our website is open to any citizen journalists who want to contribute, publish high-quality articles, analyses to improve public access to impartial information. You and we have the right to know, learn, read, hear what and how we deem appropriate. Unlike many news organisations, we have no sponsors, no corporate or ideological interests. We don’t put up a paywall – we want to keep our citizen journalism as open as we can. Although underresourced & primarily volunteer-based, we do our best to provide the community with access to quality and true unfiltered news. For any problems using the website, or mobile site and their links, or general questions and feedback about MirageNews.com, or sending a story or for any story removal requests , please contact us.